Safe Torque-Off is certified at ISO 13849-1 PLe/SIL3. No external relay required to meet EN954-1 Category 3. Prevents drive restarts after the safety circuit is tripped. 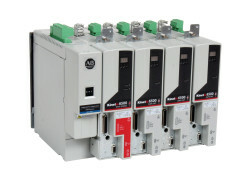 Safe Speed Monitor combines the Safe Torque-Off capability and an embedded safety relay with the Rockwell Automation® Safe-Speed Control core technology in one hardware option embedded in the drive. Certified PLe/SIL3.